Once the Network license server is set up, BricsCAD can report error -17 when trying to connect to server. Reasons can be due to the presence of an antivirus and/or a firewall and/or a proxy server. If a antivirus software is running on the server and blocking the License Server program (rlm.exe on Windows, rlm on Linux/Mac), the RLM service needs be unblocked in the antivirus. See your antivirus configuration on how to unblock services. This port number is dynamically assigned when the License Server starts. To open this port in the firewall, it must be first set in the Bricsys.lic file on the server. Open the License Server Administration web interface at http://localhost:5054. Click the Status button on the left. 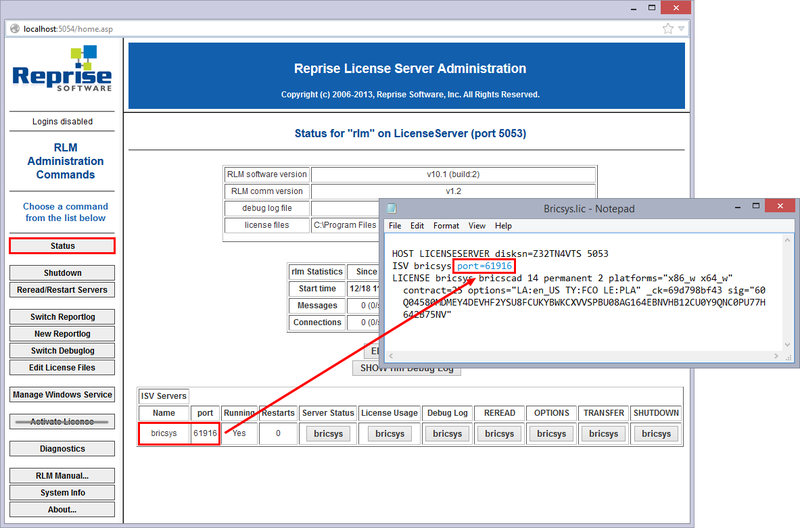 The page Status for "rlm" on [LicenseServer] (port 5053) opens. In the ISV Servers table, look at the bricsys row. The port number is displayed in the second column. Copy this port number. Open the Bricsys.lic file in a text editor (Notepad, Gedit, ...). The default location of the file is C:\Program Files (x86)\Bricsys\Bricsys Network License Manager. where [port number] must be replaced by port number copied from the ISV Servers table. In the firewall, open both numbers 5053 and the port number you added in the Bricsys.lic file. Shut down and restart the License Server program. If this does not solve it, add the License Server program (rlm.exe on Windows, rlm on Linux/Mac) as an exception onto the firewall exceptions, then restart the License Server again. If a proxy server exists between BricsCAD and the License Server, proxy settings should be configured in BricsCAD. See how to configure the proxy settings permanently for Network License use.